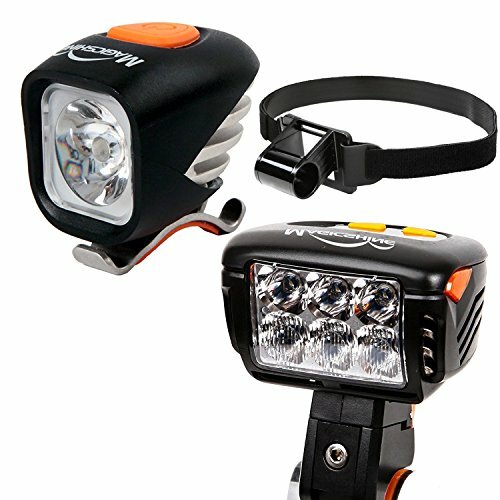 Magicshine Field Staff Choice MJ-900 Headlamp + Eagle M2 Bicycle Headlight, MTB Enduro Bike Light Combo | Spot Beam Flood Beam Combo Beam for Mountain Biking, Trail by Magicshine at Joes V Cycle. MPN: MJ900 Eagle M2. Hurry! Limited time offer. Offer valid only while supplies last. BICYCLE HEADLIGHT + HELMET LIGHT MTB ENDURO CYCLING LIGHT SET ★ The Magicshine Eagle M2 bar light has an ACTUAL max output of 2400lumens. MJ-900 Cree Headlamp comes with 6058 helmet strap and can put out a maximum of 1200 lumens of illumination. MTB BAR LIGHT HAS 3 BEAM PATTERNS AND 5 WORKING MODES ★ 10% 25% 50% 75% and 100% intensity under each of the Spot Flood Combo beam pattern modes. Suitable for every kind of rider. While the MJ-900 offers 100% 50% 30% Flash mode and a 20 degree beam pattern. HIGH QUALITY BATTERY PACKS ★ Default battery for Eagle M2 is MJ-6039, Combo beam pattern runtime on Max = 2.5 hours, Flood/Spot beam pattern on Max = 4.2 hours. Default battery for MJ-900 is MJ-6092, runtime on Max = 2.6 hours. Magicshine only uses tested high grade battery cells with over-charge, over-discharge protection chips ensuring performance and safety for our riders. REMOTE CONTROL ★ Remote control for the Eagle M2 front bar light is also included, changing beam pattern and working mode on the go has never been easier.